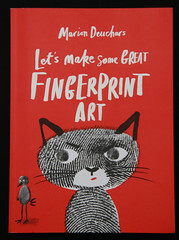 Marion Deuchars’ Let’s make some great fingerprint art is the latest in her series of books that inspire children to explore artistic practice. The book has the appeal of a half-finished sketchbook, begging for inky fingers and paint-covered hands to fill its pages, writes Sarah Snaith. Let’s make some great fingerprint art couldn’t be properly reviewed without enlisting the help of some south London kids. 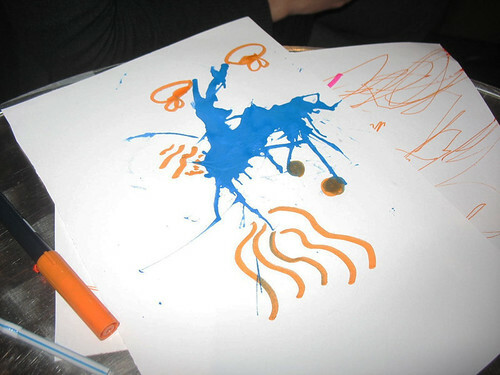 Two year old Evie and her Mum tried out blow painting strange creatures. They made an orange and blue slug wearing shoes. Like the first minutes of a life-drawing class, the activities start fast and loose. 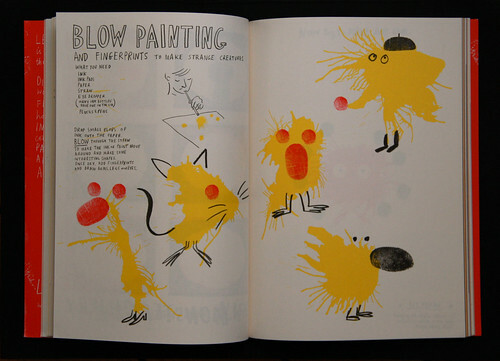 Crammed into small spaces are lively and gestural characters that maintain Deuchars’ recognisable illustration style, one that is non-threatening to children trying to mimic every line. Betty was a well versed young artist. 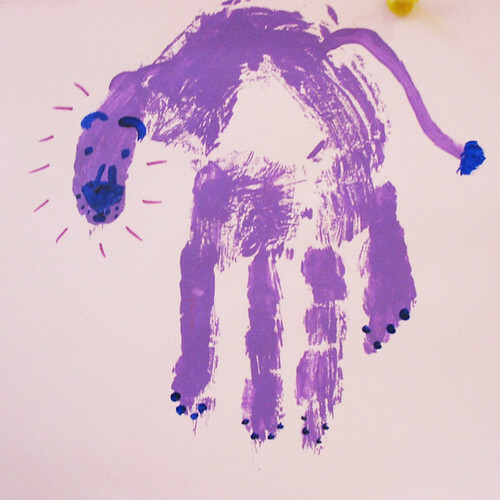 While she crafted her purple lion, her Mum told me about ‘kitchen lithography’ – print-making with cola and carbon paper. 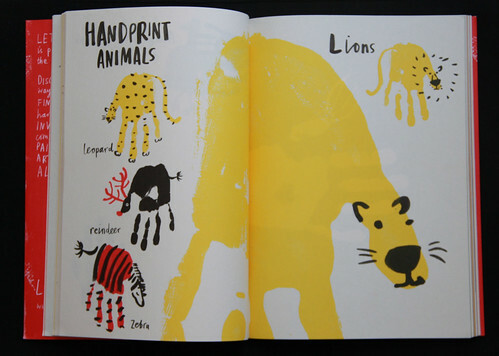 Spread from Marion Deuchars’ Let’s make some great fingerprint art. Simple forms and basic techniques are introduced to morph fingerprints into anything from pigs to top-heavy muscle men. Without a stated age-range, pages flip between easy to complete tasks and lengthier, yet equally playful, ways of creating pictures of animals, dinosaurs and monsters. Blow-painting, paper-cutting and fingerprinting letterforms are all part of the fun, in addition to printing with rubbish and making smeared running men jump and dance to silent music. 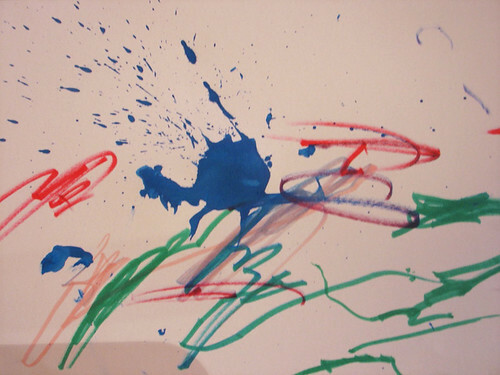 The father and son pair took a more abstract approach to their piece using ink, some straws and coloured markers to fill the page. 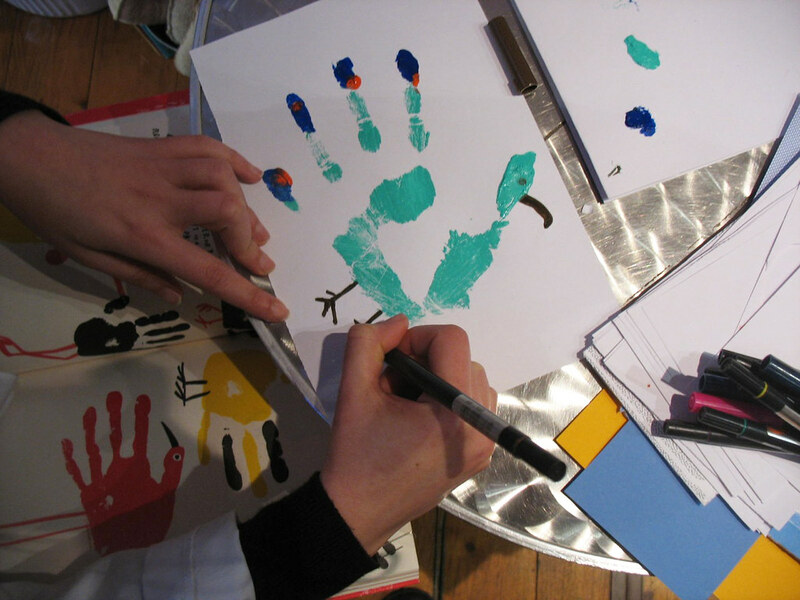 Let’s make some great fingerprint art shows the diversity of freehand brush strokes and an active imagination, a lovely follow up to Deuchars’ previous Let’s make some great … titles. More about Marion Deuchars in ‘Up and down the city road’ on the Eye blog. 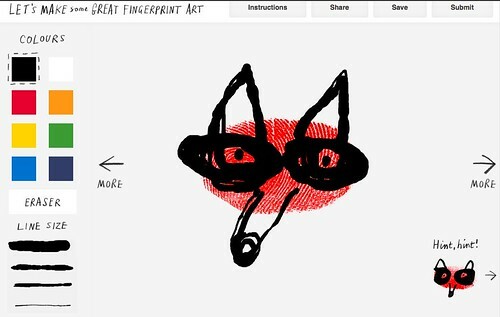 Try fingerprint art for yourself (see above) in a digital setting by going to Deuchars’ letsmakesomegreatart.com website.